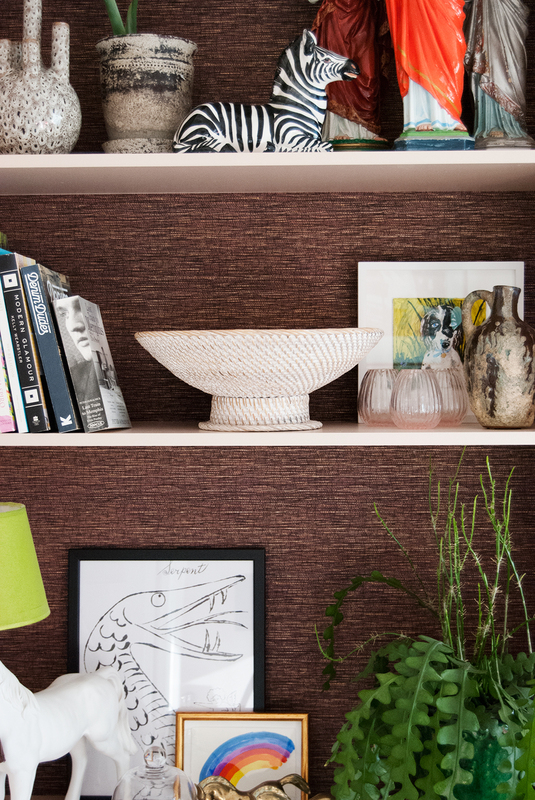 You may have already seen that my living room shelves have been given a facelift with some textured wallpaper, but I wanted to tell you a bit more about them because I've had so many lovely comments and loads of interest, and I couldn't be more pleased with how they turned out! 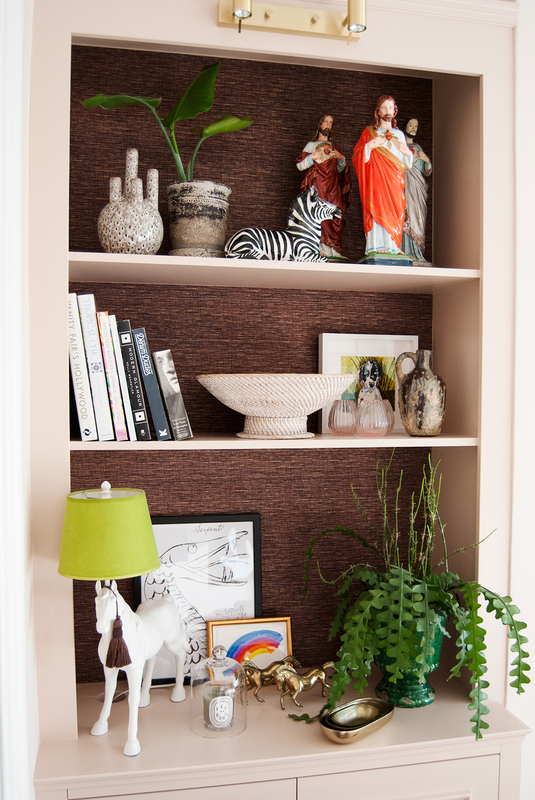 I'd had a bee in my bonnet for several months about adding some depth and texture to the backs of the shelves with some grasscloth. Something to draw the eye in, giving a dramatic backdrop to my ever changing (and growing!) collection of treasures. I looked at loads of different options over a period of several weeks (months! ), I um'ed and ah'ed about what I would go for. I knew I wanted to go for a dark colour, perhaps a brown. At one point I'd decided on a stunning heavily textured jute grasscloth from Urbane Living, but I've been spending so much on the house, and it was quite pricey so I kept hesitating and not ordering it. Do check their collection out if you're in the market, because they have some incredible textured wallcoverings, also including linen, seagrass, cork and bark cloth and bamboo. 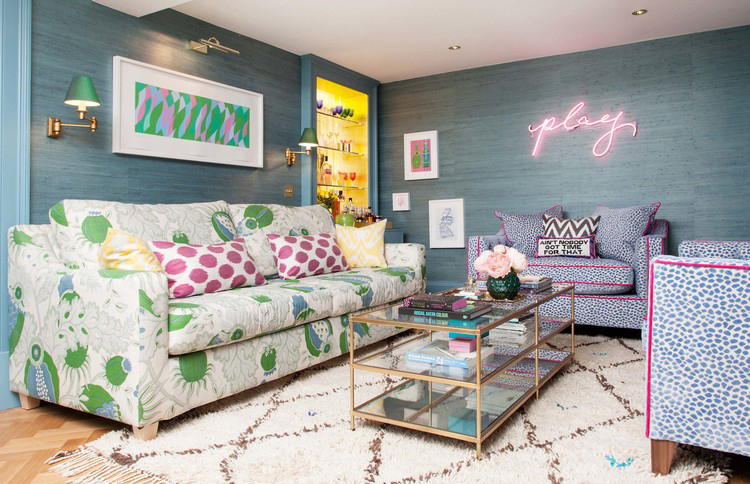 I'd also drooled over the amazing collection from Phillip Jeffries whose grasscloth comes in the most delicious range of colours including Tantalizing Teal, that adorns the walls of this über glam 'den' belonging to Emily Murray of The Pink House. Amazing, right? Alas, this was also out of the question for me for this little project, but again, check out the Phillip Jeffries collection if you're in the market because it really is stunning. I'd initially ruled out cheaper options as I'd previously ordered some samples that were so shiny and cheap looking it had put me off the idea of more budget friendly options. However I figured I should at least look at some other cheaper options since budget was an issue, so after trawling the net some more, I stumbled upon a few from Graham and Brown that looked really lovely. They were so reasonably priced (cheap! ), that I really wasn't holding out much hope to be honest. When the samples arrived I was super pleasantly surprised by the quality, and knew that the Burgundy and Copper Grasscloth was 'the one'. And with a pricetag of £20 per roll (slightly less with a discount code I found) it was a no-brainer. The brown base with touches of burgundys and pinks was the perfect choice. It ties in beautifully with not only the pink walls, but everything else I've got going on in the room too. I ordered two rolls, but when it arrived I realised that if I laid the paper horizontally rather than vertically, that I'd only need the one roll, so I've sent one back, meaning I did this entire makeover for around £20! The wallpaper glue I used was a powdered one that was less than £3 from my local DIY shop, for heavyweight, paste the paper wallpapers, and I just brushed it on with a normal paintbrush. I actually love the grain running horizontally and it also meant that there are less joins. I'm not experienced at wallpapering at all, but I know that paste the paper wallpapers are harder to handle than the paste the wall kind. However, as I was papering relatively small pieces, it wasn't a big deal at all, and it's probably good I didn't realise before I ordered it as it would have put me off! So there you go - no excuses not to pimp your shelves! It's easy and so effective. This is so beautiful Bianca. I'm going to check this supplier, as I've being looking for grasscloth and found it to be out of my price range. They look FABULOUS!! 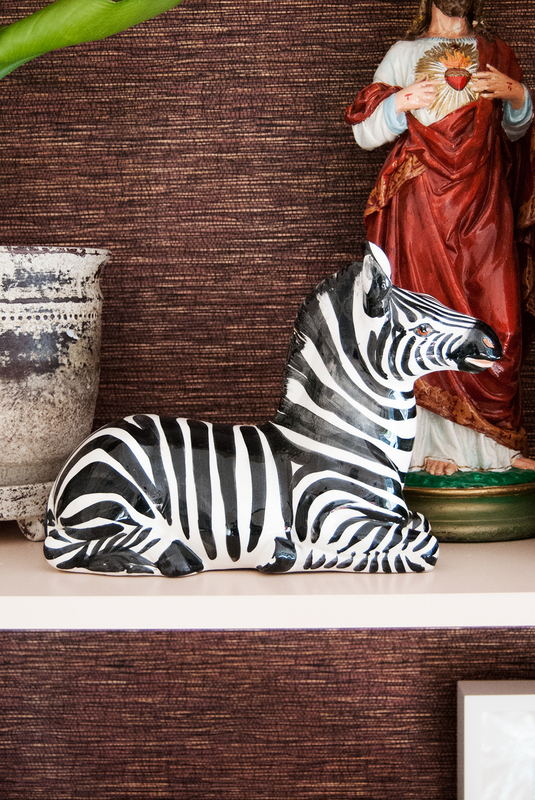 I am absolutely going to blatantly copy you if you don't mind and do this on my living room shelving units which I would take out if I could but can't as am banned from doing so and they bore me senseless. Love all the products you've recommended too. Great to know that G&B do grasscloth! They are such good value compared to other wallpaper brands. The shelves look great- love the styling! I bought this grasscloth to do my shelves and it was so stunning I have ordered more and am doing my two alcoves with it. My tub chair is being recovered in a leopard print fabric and it was looking too heavy but this paper is grounding it really well. Thank you for the find! !